Gold American Eagle coins revived one of the greatest coin designs in American history. Augustus Saint-Gaudens’ Liberty design from the $20 Gold Double Eagle is widely regarded as the finest design ever to grace an American coin. Today it lives on as the face of the Gold American Eagle across all weights and versions. 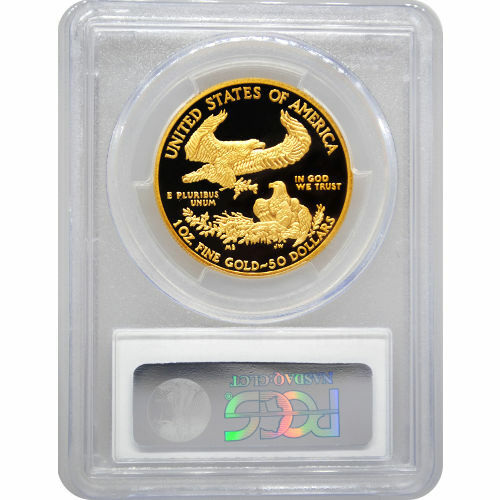 Right now, the 1989-W 1 oz Proof Gold American Eagle is available as a perfect specimen from Silver.com. Fourth annual release of the Proof Gold American Eagle coin! Bears a face value of $50 (USD) backed by the federal government. Issued a grade of PR70 by the Professional Coin Grading Service. Deep-cameo grade. Obverse features Lady Liberty. Reverse bears the American bald eagle. Features a “W” mint mark from the West Point Mint. When President Theodore Roosevelt sought to overhaul the nation’s gold currency designs in the early 20th century, Augustus Saint-Gaudens was the first artist he turned to for assistance. An Irish-American, Saint-Gaudens was late in his life when Roosevelt sought his help. Saint-Gaudens’ Liberty image featured a full-length figure of Liberty as she strode forward from the nation’s capital as a guiding light for the nation. Featured on the $20 Gold Double Eagle until 1933, Saint-Gaudens never saw his design in circulation. The coins were introduced in 1907, just months after his death following illness. Each 1989-W 1 oz Proof Gold American Eagle listed here is a perfect specimen according to the PCGS. Coins in PR70 condition exhibit full, original luster from the mint and lack any detracting flaws on the surfaces. Deep-cameo is a term reserved for proof coins that highlights a unique finish. Each one has a strong, frosted finish to the design set and a deeply-mirrored, clear background field that creates an impressive contrast. On the obverse of each 1989-W 1 oz Proof Gold American Eagle is the image of Liberty, surrounded by 50 stars and an engraving of the word “Liberty.” This image originally featured only 46 stars until 1912, at which point two more were added to reflect the entrance of Arizona and New Mexico to the Union. The reverse of all Gold American Eagle coins features the exclusive American bald eagle design from Miley Busiek. In her depiction of the eagle, a male flies over the nest while a female stands watch over the nest and the hatchlings within. Graded Proof Gold American Eagle coins are sought after in anticipation for gold’s continued historic value, which you can monitor minute by minute via our active charts that show the spot price of gold. If you have any questions, please don’t hesitate to ask. A Silver.com associate is available on the phone at 888-989-7223, online using our live web chat, and via our email address.